শুভ নববর্ষ - Happy New Year! শুভ নববর্ষ ( 'Shubho Nabobarsho') - Happy New Year! Why do we celebrate New Year in midwinter? Why not kick things off in Spring as the sun finally comes out, the the flowers unfold, and life begins again... The Bengalis have it right! 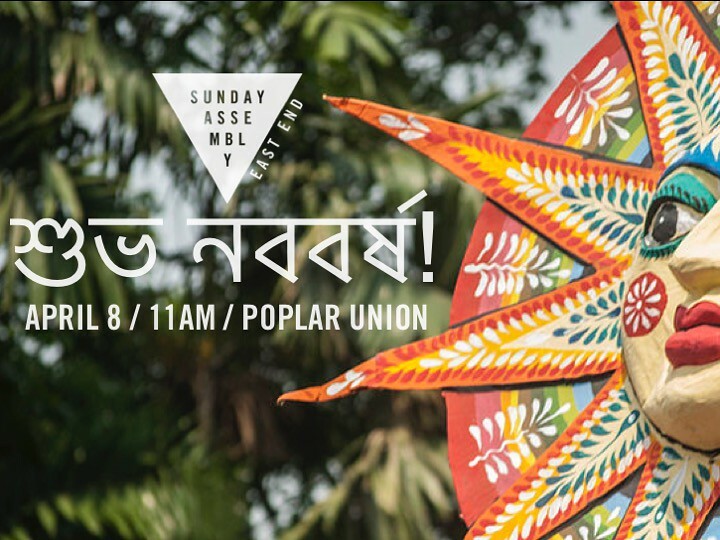 At Sunday Assembly East End this month we'll be celebrating Bengali New Year (Pôhela Boishakh), and learning about the rich culture of one of London's largest diasporas. Our main speaker will be T M Ahmed Kaysher - a poet, writer and critic as well as the director of Saudha, Society of Poetry and Indian Music, one of the eminent Indian classical music promoters in the UK. He is also the key organiser of RadhaRaman Festival, the largest Bengali cultural event in the North. He'll be giving us an introduction to Bengal's fascinating and complex history, and some of the diverse art forms the Bengali people have produced. We're also delighted to be welcoming back one of our favourite poets, Shamim Azad, who performed at our first ever assembly in May 2016! Plus our usual celebratory classic pop, building community over tea and coffee (and hopefully some Bengali treats...) , and reflecting together on how we can help each other bloom with the bluebells! Sunday Assembly East End is an inclusive, secular congregation that celebrates life, in all its strange, tragic, absurd and beautiful glory. Come together!